In April of 2014, we moved our lives and business to a floating home on the Columbia River in Portland, Oregon (pronounced OR-Eh-gone). Entrusting Craigslist to offer up some useful rental leads, I answered an ad titled, “Floating Apartment,” listing the rent at significantly lower than most in Portland. There were no pictures and Christy was headed to a conference in Portland. I thought, “Why not?” I called and scheduled and appointment with my landlord to be, who was instantly suspicious that I was a weirdo to want to live on a floating home. He lives in a floating home next door. Classic projection on his part. I assured him that I am only as weird as he is and arranged to see the place. I loved it. After years of living in Salt Lake City, a beautiful hikers paradise in the desert, we knew it was time to grow the business and our lives. Portland is a natural choice. A youthful, tech savvy town with a highly inbound migratory population and emphasis on local business. Our kind of people. Learning about living & working on the river is fascinating and bizarre. It is as much a study in personalities as it is wildlife, infrastructure and currents. River people are strange folk. The basic profile includes alcohol involved camaraderie, gossip and a good measure of good-natured concern for one another. Everyone has a reputation that bears out over time. The boardwalks within the moorage or floating home community are divided into rows. Each row has it’s own character, socio-economics and antics. I live on a row commonly referred to as “pirate row.” There is not plundering or whoring but otherwise this title is right on the mark. The average age of residents is in the mid to late 60’s range. We are the youngest residents by a considerable margin. The tenants trend toward the younger age groups. There is a roommate in his 30’s I rarely see. A Stand Up Paddling (SUP) entrepreneur in his….early 40’s…? A 911 operator, I don’t dare speculate about. She’s currently hosting my tomato plants while construction is done on the pilings of our row aka neighborhood. 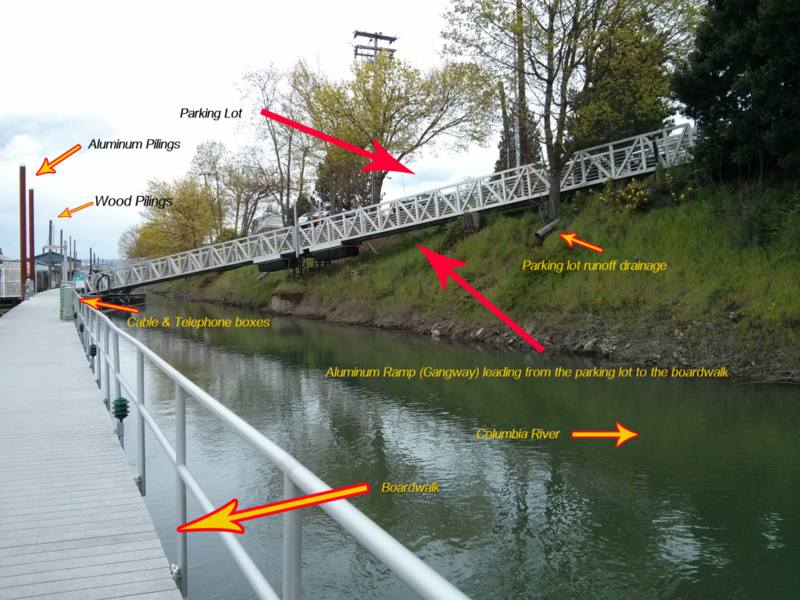 Our home is attached to the boardwalk, which is attached to very large, wood pilings drilled into the Columbia River’s sediment, roughly 25 feet below. 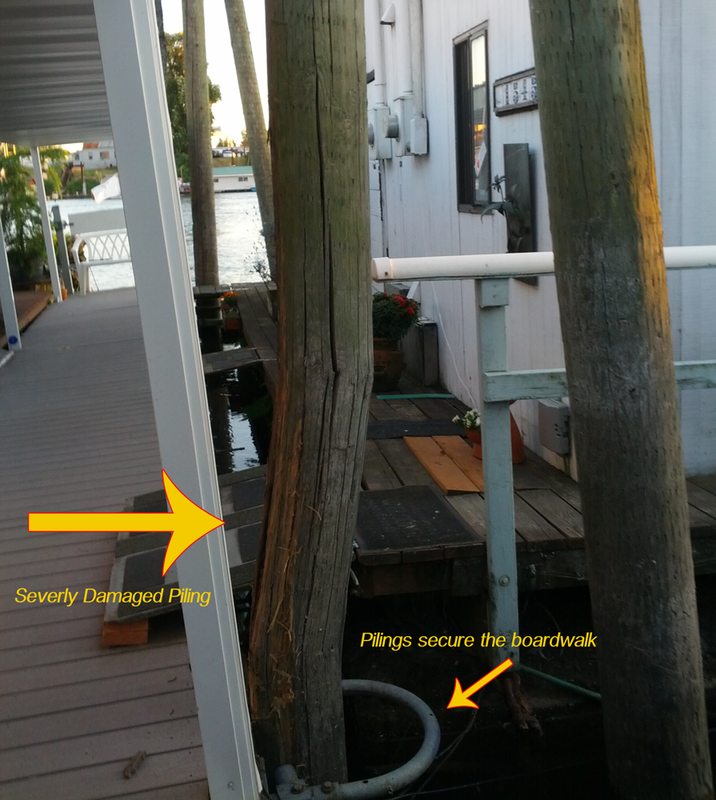 One of the pilings on our row snapped last week due to extensive wood rot. HOA dues are paid for the benefit of a boardwalk to secure your home. Today is our lucky day. After living here for only a few months a repair that is years overdue is happening now. I’m writing this right before loading up the car to spend the next 4 days in a hotel. The divers and tugboats are on their way to detach our homes, tug the homes to another row for a few days while repairing the pilings. I will be documenting the process. This is not the average Monday morning distraction. I have my VOIP phone set up to forward to my cell phone. I’ve got my client folders neatly packed and the cats are getting anxious now that the kitty carriers are out.